Siam Kempinski Hotel Bangkok welcomes the return of renowned Michelin-starred Chef Henrik Yde Andersen to present his unique gastronomical experience exclusively at Sra Bua by Kiin Kiin. Chef Henrik invites all patrons to join him on an unforgettable journey as they enjoy his new menu creation on three exclusive nights from 6 to 8 September 2016. Chef Henrik is the founder of Copenhagen’s famous flagship Kiin Kiin restaurant. 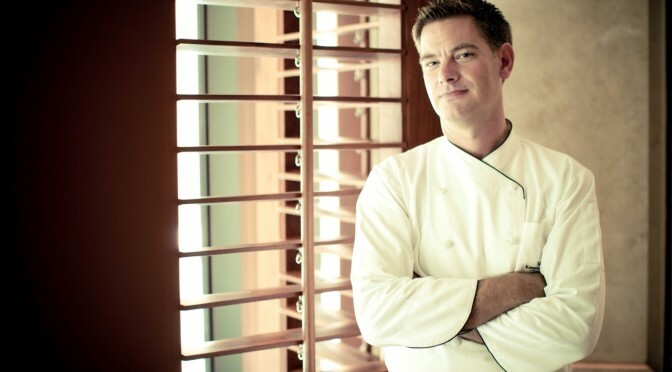 He also oversees operations at Sra Bua by Kiin Kiin, the award-winning restaurant at Siam Kempinski Hotel Bangkok. 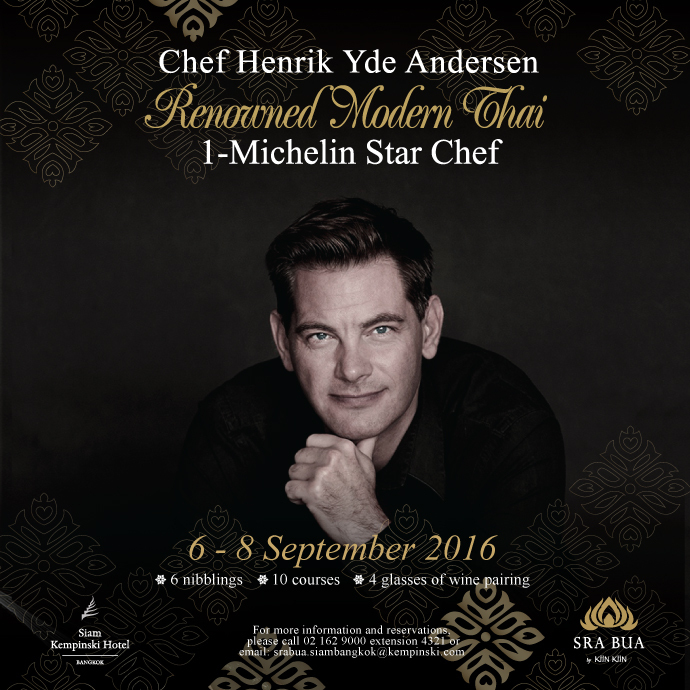 During his return visit to Bangkok in September, he will present a series of unique ten-course dinners featuring Thai dishes and ingredients with delightfully impressive modern twists priced at THB 5,900++ per person including four glasses of wine. 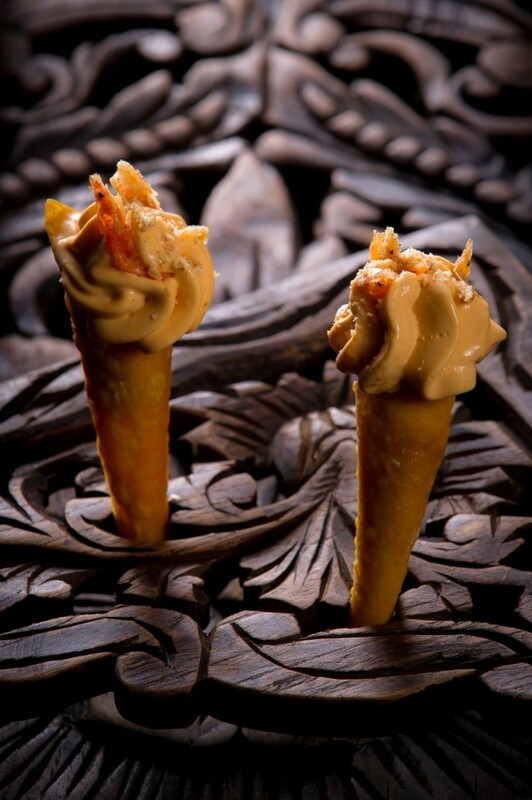 Each exclusive night begins with a selection of six authentic Bangkok “street food” nibbles. The ten- course set menu will be accompanied by four glasses of wine, selected carefully to complement the dishes that reflect Chef Henrik’s passion for merging Thai ingredients and recipes with modern culinary techniques and interpretations. Be the first to experience this unforgettable culinary journey by joining Chef Henrik’s “one-of-a-kind” gastronomical evening featuring Thai dishes and ingredients. Henrik Yde Andersen is extremely well qualified as a creative chef of fine French cuisine. An open- minded Danish chef has been fallen in love with Thai cuisine when he made a trip to Thailand in 2000. The holiday, which was planned for 10 days, became the life changing one as he stayed up to five years. He collected many recipes, traditional and modern, whilst gaining valuable ‘hands-on’ experience and knowledge about the secrets of Asian cooking. This inspired Chef Andersen to open the iconic Kiin Kiin restaurant in Copenhagen in 2006. The award winning restaurant, Sra Bua by Kiin Kiin, offers one-of-a-kind fine dining experience. The restaurant incorporates the art of Western cooking techniques into the original recipes, leaving them all a unique Thai-inspired modern cuisine. Behind beautifully composed food presentations, the familiar flavours of original Thai dishes are maintained. Diners may experience a curry served with the texture and temperature of ice cream. Everything from oyster sauce to prawn crackers is home-made in the Sra Bua by Kiin Kiin kitchen.